Lill has recorded for Deutsche Grammophon, EMI (Complete Beethoven Piano Concertos with RSNO and Gibson), ASV (both Brahms Concertos with the Hallé and Loughran) plus the complete Beethoven Sonatas and Tchaikovsky l with the LSO and Judd. More recently, he has recorded the complete Prokofiev sonatas with ASV and his recent recording of the complete Beethoven Bagatelles and Piano Concertos with the CBSO and Weller is available on Chandos. He recorded Malcolm Arnold’s Fantasy on a Theme of John Field (dedicated to John Lill) with the Royal Philharmonic Orchestra and Vernon Handley for Conifer. He has also recorded the complete Rachmaninoff Concertos and major solo piano works for Nimbus Records. 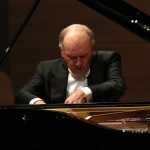 His most recent recording projects have been the 60th birthday release of piano works by Schumann on the Classics for Pleasure label and new releases for Signum records of Schumann, Brahms and Haydn.